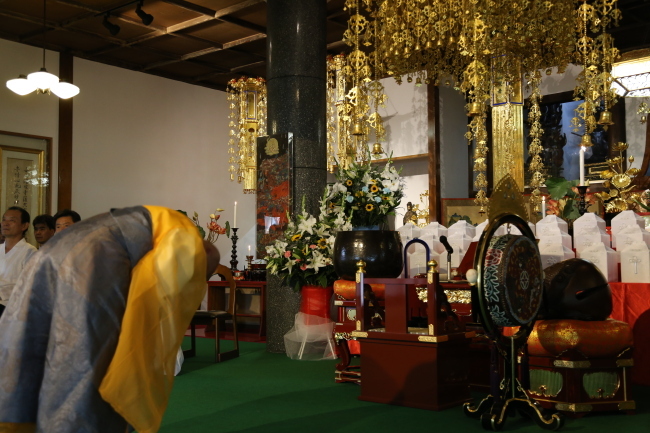 TOKYO -- A Japanese Buddhist temple has conducted a memorial for 35 sets of remains belonging to Korean people brought to Japan to work for its factories and military during World War II before they are sent home this week, a South Korean civic group said Monday. Representatives of the civic group, organized in 2008 for the return of the remains of Korean forced labor victims, took part in the ritual at Kokuhei Temple in western Tokyo on Sunday, along with South Korean activists, officials of the General Association of Korean Residents in Japan, known as Chongryon, and the temple's Japanese followers. One of the 35 sets of remains is known to belong to Park Sung-soo, a Korean hailing from what is now South Gyeongsang Province. Park was born in 1902 and fell to death at a dam construction site in Gunma Prefecture, northwest of Tokyo, in 1942, the civic group said. The temple, whose chief is Yoon Byeok-am, a Korean living in Japan, agreed last year to return a total of 101 sets of remains of Korean forced labor victims to South Korea. It sent 33 sets of remains last year and another 33 sets early this year. The civic group plans to bring the 35 sets of remains to South Korea on Tuesday, one day ahead of the anniversary of Korea's liberation from Japan's 1910-45 colonial rule, before holding a national memorial for the victims and interning them at a cemetery in Paju, north of Seoul, run by the Seoul metropolitan government. Kokuhei Temple and the civic group hope that the remains will be enshrined at a peace park inside the demilitarized zone separating the two Koreas if the park is built as a result of improved inter-Korean relations. About 2,770 sets of remains belonging to Korean people forcibly brought to Japan to work for its factories and military during World War II have yet to be repatriated and are still kept at temples or charnel houses across Japan. South Korea and Japan agreed to launch a joint project to return remains of the victims of forced labor after a 2004 summit between President Roh Moo-hyun and Prime Minister Junichiro Koizumi. 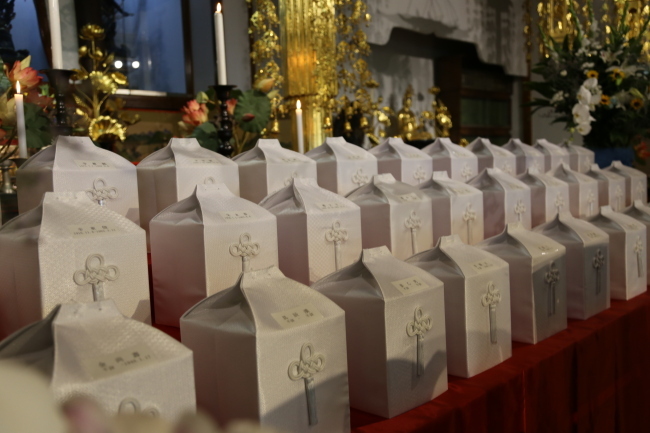 Following the agreement, 423 sets of remains kept in Yuten Temple in Tokyo's Meguro Ward were sent to South Korea four times between 2008 and 2010. Negotiations between the two countries to implement the project were stalled by a diplomatic chill in the wake of South Korean President Lee Myung-bak's visit to the country's easternmost islets of Dokdo in 2012. A pro-unification civic group, the Korean Council for Reconciliation and Cooperation, said last month that it agreed with its North Korean counterparts to jointly push for the return of the remains of such victims from Japan.